Single Door Rigid Live Trap, Model 102, is our most popular selling trap. 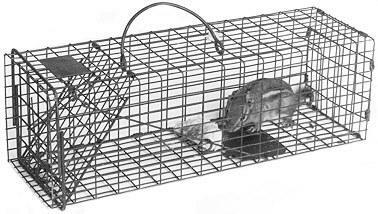 It is the most perfect trap for catching chipmunks and rats because of its small ½ x 1 inch wire mesh openings. Size = 16" x 5" x 5"
Grid Construction = ½" x 1"
If storage space is a concern, Model 102 is also available as a collapsible trap, Model 201, and as a transfer trap with a rear sliding door, Model 602. The rear sliding door is HIGHLY recommended because it makes baiting and releasing the animal much easier. Model 201, is the most popular selling collapsible trap. It is perfect for catching chipmunks and rats because of its small ½ x 1 inch wire mesh openings. Deluxe Transfer Trap, Model 602, is just like Model 102, but it also has the added benefit of having a rear release door. This addition, and it small ½ x 1 inch wire mesh openings make Model 602 a must-have for catching chipmunks and rats. What Damage to Rats do? Rats cause a huge loss of food worldwide. 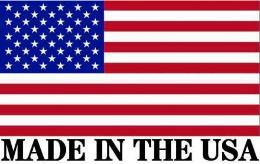 Besides eating our food they spoil it by contamination with their feces, urine, or fur. They can be found not only in our homes, but supermarkets, restaurants, warehouses, food processing facilities, livestock facilities, and farm fields. What bait should I use for Rats? Cereal, grains, nuts (especially peanuts) sunflower seeds, anise oil (a drop or two on bread), shelled corn, apples work well for bait. Mixed peanut butter and oatmeal or peanut butter and molasses, popcorn. One trapper swears by almond extract on bread as bait to tempt the nearest rat. Where should I place Rat traps? It is very important to use plenty of traps. As many as six traps for only one or two rats is appropriate. In a commercial building or restaurant as much as a couple of dozen is needed.The traps should be placed in darkened corners, along walls, behind appliances and any areas where droppings have been sighted. In trapping for rats, place traps about 10 feet apart since they don't travel very far. If the rat population is large, place the traps about 15-20 feet apart.